TreeMap is a visual representation of a data tree, where each node may have zero or more children, and one parent (except for the root). Each node is displayed as a rectangle, can be sized and colored according to values that we assign. Sizes and colors are valued relative to all other nodes in the graph. Following is an example of a treemap chart. We have already seen the configurations used to draw a chart in Google Charts Configuration Syntax chapter. Now, let us see an example of a TreeMap Chart. 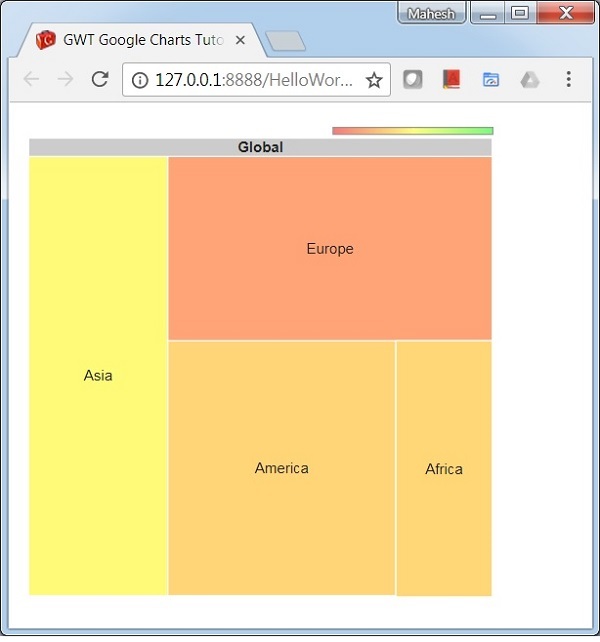 We've used TreeMap class to show a TreeMap chart.